Grow the new super fruit in your own garden! 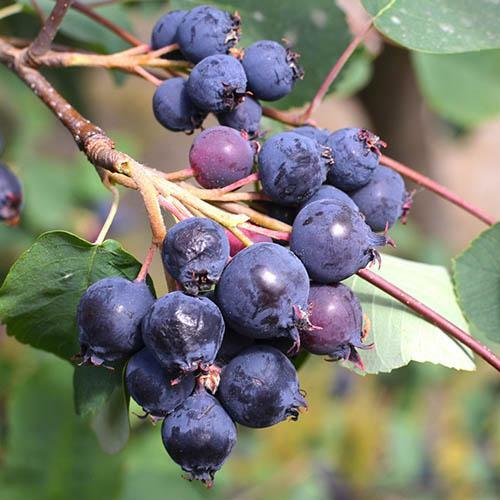 Known by many other names including Saskatoonberry, Juneberry, Serviceberry or Shadberry, Amelanchier berries have been hailed as the next Superfood, with more antioxidants than a blueberry! Supplied as an established plant in a 9cm pot, they can be grown in a large pot or planted singly in the garden as a specimen or en masse as a productive hedge. Sure to become a must-have plant, we have limited stock available so get yours now and enjoy year-round benefits! Guaranteed to be a hit with both Grow Your Own enthusiasts and ornamental gardeners, the relatively compact bushes of the Greatberry reach around 2-3m and bring something special to your garden each season with spring blossom, summer fruit, autumn leaf colour and winter form. In spring, the bushes are covered in masses of delicate white blossom and are often described as looking like a big candy-floss! The delicate, star-shaped flowers have a subtle, sweet fragrance and are self-pollinating. The tiny blooms are followed, in summer, by the large, juicy blueberry-like fruits, each up to 1.5cm (1/2in). A fiery display of autumn colour will greet you from late September, when the leaves take on hues of orange and red before they fall, revealing the delicate tracery of branches which brings architectural interest to your garden. It is the fruit however that is getting the serious attention. The wild fruit has been cultivated in Canada for decades and known only a handful of people, so we're really excited to bring this exciting discovery to UK gardeners. The Juicy, sweet berries are similar in appearance to the familiar blueberry and have a slightly sweet, almond taste which makes them distinctly different. Picked directly from the plant they can be eaten fresh or processed into delicious jams, fruity smoothies, delicious cakes or creamy ice cream. Attractive in the garden, their compact size mans that Greatberry can also be grown in a big pot on a terrace or balcony, so you don't even need a lot of space to benefit from this new wonder fruit! Fully Winter Hardy ´Greatberry´® are robust and healthy plants which tolerate temperatures down to – 40C and the sturdy upright shrubs or small trees are 1.5m to 4m high. Plants freely produce abundant berries and they can also be grown as a productive, flowering hedge, as wind protection and also bee pasture or wildlife gardening as birds love the berries! Easy to maintain, unpretentious, extremely hardy and gorgeous in the garden, get yours now as stocks are limited this year! Supplied as an established plant in a 9cm pot, the compact plants can be grown in a large pot or planted singly in the garden as a specimen or en masse as a productive hedge. Amelanchier alnifolia will grow in most soils, in general, adapting to wherever they’re planted although heavy, wet soils should be avoided. Best grown in full sun in a slightly acidic soil, they're fine in semi-shade and in neutral to slightly alkaline soil, so really are a great all-purpose plant. Totally winter hardy, they'll put up with temperatures as low as -40C. ´Greatberry´ (R) are particularly undemanding, easy-to-care-for and robust wild fruit plants. They do not need pruning, apart from a little trim to keep them to your desired height in March or October, and don't need regular feeding as they can grow even on nutrient-poor soils. A multi-purpose feed is recommended both in the early spring at the start of growth and in early summer for berry maturation.